Celebrate the end of the season with special gift ideas for the men who volunteer their time to teach the game of football. From personalized frames to engraved whistles, we have great gift ideas. Our Engraved Football Wooden Picture Frame measures 12 3/4″x 10 3/4″ and holds a 10″ x 8″ photo of your favorite Football player or team. Each Personalized Football Photo Frame includes an easel back allows for desk display. Engraved football gifts include FREE Personalization! Personalize your Football Picture Frame with any name and two line custom message. Whether you are looking for a centerpiece for a football celebration, a gift for an outstanding player of the year or a thank you to a one of a kind football coach, this Touchdown Lollipop Bouquet is a tasty gift idea. Silver 2 ¼” x 1” coach whistle on black lanyard is the perfect gift for your teacher or coach. 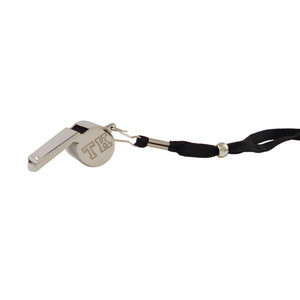 Personalize this gift with up to two initials on the face of the whistle which has a clear and distinct sound. Whether you are at the pool or gym or in recess, this whistle is the ideal accessory for the coach or teacher. For more coach gift ideas, visit http://www.gavoon.com. This entry was posted on October 20, 2009 at 1:12 pm and is filed under Coach Gifts with tags Coach Gifts, football coach gift, football frame, personalized coach gift. You can follow any responses to this entry through the RSS 2.0 feed. You can leave a response, or trackback from your own site. Some very interesting and insightful thoughts. I like this.^_^ because I have a blog about gifts too.